I like to challenge myself in my reading. How to Bake Pi definitely challenges me. Eugenia Cheng is a woman of extraordinary talents. 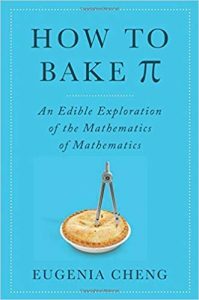 Scientist in Residence at the School of the Art Institute of Chicago, honorary fellow of pure mathematics at the University of Sheffield in England, pianist, and according to this book, baker. Each chapter begins with a recipe, which Cheng uses to illustrate some principle of math (or “maths,” since she is English). Some of the recipes are shockingly easy–dump ingredients into a rice cooker and let it sit on “warm” for several hours. Others are quite involved. The recipes, though, are not the main part of the book. They are introductions to demonstrate the lessons Cheng wishes to teach about the math principles. Cheng’s writing is funny, approachable, and accessible. She is wholly committed to her theme: Math is easy. Or, more accurately, math is a way to make complex things easier. It uses logic and proofs to demonstrate how and why things work the way they do. Kitchen recipes follow patterns. Some of them are step by step. Take 2 ingredients, mix them, add additional ingredients, mix them in with the first two, apply heat, eat yummy result. Others are more abstract. Some require specialized knowledge or unusual ingredients or specific tools. Cheng uses these qualities of recipes to show similar qualities in math. I will confess, I am no mathematician. Nor am I a good cook. (Our recipe and review pages are done by my wife, who is an outstanding cook. I do help her test the recipes, though!) A lot of the book went past me. But it did so while leaving some strong impressions. First, I really wish my math teachers had used food as a teaching tool! Second, I really wish I had never “learned” that math was hard. I can’t say that Cheng has persuaded me that math is easy, but she has persuaded me that my painful memories of early morning trigonometry failures are not the whole story of math. All in all, How to Bake Pi is a fun and enlightening book that is able to reframe math for the numerically challenged. And give you some new ideas on preparing food as well.